What you looking at? I know….. While watching a movie, we easily figure out the characters that are interacting with each other even if they are in different frames. Ever wondered how we are able to do that so effortlessly ? and we have all the information of geometry of the surroundings. In this article, I will be explaining the research paper Following Gaze in Video. [Proceedings of the IEEE Conference on Computer Vision and Pattern Recognition. Recasens, Adria and Vondrick, Carl and Khosla, Aditya and Torralba, Antonio, Pages 1435–1443, 2017]. Fig 1. An example from a movie where the model is trying to predict the gaze of a character which is in a later scene. In the above figure, the scenes are taken from the movie “Forrest Gump”. So the scene is where Forrest meets her wife dying of AIDS(maybe). We can look at the frame in which Tom Hanks(Forrest Gump) is present and is looking at her wife Jenny Gump. Now there are couple of following frames in which there is Jenny looking at her husband Forrest in a totally different frame. And the proposed model perfectly determines the target frame in which the gazed person/object is present i.e., here, Jenny alongwith the location of hers in that frame. So now I will be digging deep into the intuition of such model and the actual details related to it. most probably to be unlikely to be from the same scene). Geometric Understanding is required to localize exactly where the person is looking in a novel frame using the head pose and geometric relationship between the frames. In this research they have trained their model using VideoGaze dataset created by the authors themselves. 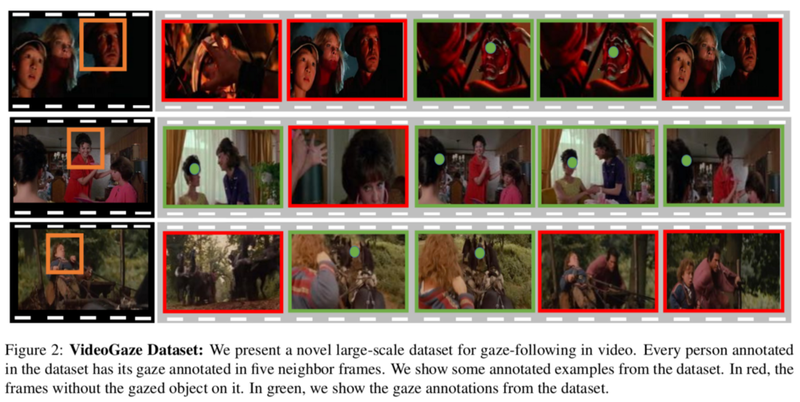 VideoGaze dataset contains 166,721 annotations from 140 movies. To build the dataset they used videos from the MovieQA dataset. Each sample of the dataset consists of 6 frames. The first frame contains the character being considered whose gaze is annotated. Eye location and a head bounding box for the character are provided. The other 5 frames contain the gaze location that the character is looking at that time, if present in the frame. In the above figure, the frame with green borders are the ones having gazed object in them and the red ones doesn’t have gazed object in it. This pathway is responsible to detect the salient regions of the target frames. This pathway is responsible for predicting the parameters of the gaze cone i.e., cone of field of view. This pathway is responsible for prediction of transformation parameters in order to relate different coordinate systems imposed by xs and xt. I will be discussing these pathways in detail a little later. Before that, have a look at the network architecture that is proposed to predict the gaze location. ue : Coordinates of the eyes of the person within the frame xs. predict the coordinates of the person’s gaze ŷ in xt. Components of the Network in computation order is as follows so that you have no difficulty in understanding the complex model architecture. encircled dot is the element-wise product operator. S(xt) is intended to learn salient objects in the target frame. where the person could be looking in the target frame xt. The structure of G is motivated to leverage the geometry of the scene. transformation pathway to learn an affine transformation. Let Z be the set of coordinates inside the square with corners (±1, ±1, 0). the conic section equation if you expand it. 1. (β1 , β2) are coordinates in the system of coordinates defined by xt. 2. Σ is a matrix defining the cone-plane intersection. however it is not discrete, which would not provide a gradient for learning. where, σ is a sigmoid activation function. Finally, to compute the intersection, we calculate Equation (4) for β1 , β2 belongs to [−1, 1]. merge 256 channels in a simple k × k map. Input : Head image xh and Eye location ue. the cone at the head of the person ue. Output : Cone Parameters v (3D direction vector of cone’s axial line that can also be considered as head pose vector) and α (cone’s axial angle). Output : CNN feature map of 256 depth of each source and target frames. followed by 3 fully-connected layers of dimensions 200, 100 and 7 respectively. and 7th one is γ(xs, xt) which is used to set G=0 if no transformation is found. This is basically mathematical computation (not any kind of neural network). encoded cone-projection mask of size 13 × 13). 1. We estimate the probability of the person looking inside a frame x t .
169-dimensional saliency pathway and gaze(cone) pathway outputs. It is basically a computation (not any kind of neural network). map from 13 × 13). target frame using (cv2.resize(output map, (200, 200)) [Interpolation]. by providing each pathway only a subset of the inputs. E[w,h] (p, q) is a spatially smooth shifted-grids cross-entropy loss with grid cell size w × h.
Look at the above equation in this way, p(x, y) is the actual target map with gaze location area having 1 as value and same goes for the predicted target map i.e., q(x, y). In this way, you can look at this loss as a special kind of classification cross-entropy loss except the fact that it is calculated using shifted-grids concept. 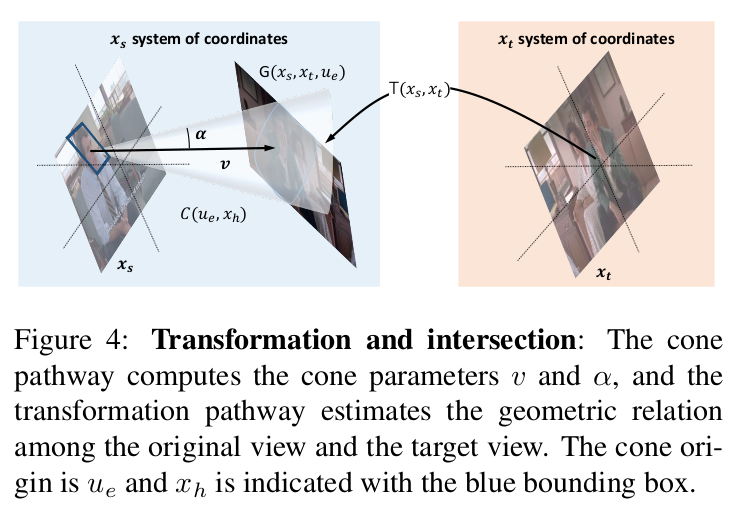 Here in the above figure, we can see the outputs from “Cone-Plane intersection” component and from “Saliency Pathway” and the final result output from “Gaze Prediction” component. From above figure, you can observe that the output from cone projection is actually the cone of field of view(of the person/character) projected on the transformed(to source image) target image. And the output from saliency pathway clearly points out the salient or important locations on the target frame at which the person/character might be looking at. In the above figure, you can see the probability distribution graph of frame selection. And on the right half, is the final output of Gaze Location (x, y) in the target frame. I know I haven’t explained loss function in detail here because the article is getting too long so I would be discussing about this kind of loss(“shifted-grids cross entropy loss”) in my next article in detail. Also I will explain other stuff in detail like “Transformation of one image coordinates to other image coordinate system in computer vision”. You must be wondering that how can such complex model be trained in an end-to-end manner and make parts of the network to learn to perform a specific task. Therefore, I will be talking about “Backpropagation in Complex Ensemble Models” in my following articles. I would highly appreciate if you could ask questions and clear your doubts related to this topic and also give suggestions too.